A flawless finish starts with your makeup brushes! Let’s be honest, we all want that flawless finish from time to time, if not every day of the week. Did you know that your quest to achieve the perfect, flawless finish actually starts with your makeup brushes? It sometimes feels like a never-ending process trying to reach the ultimate flawless goal. Thinking about your skin type and which, out of all the foundations that are available, will suit your skin type the best. Why waste your efforts of finding your perfect foundation match and apply it to your face with a dirty brush? One in five women didn’t even know they had to wash their makeup brushes …. a very worrying statistic. Makeup brushes are our daily tools, not only do they give a smoother and even application, they also keep oils and bacteria from your hands and fingers away from your face and pores. We know that touching your face with your fingers can clog your pores but your unwashed, foundation caked brushes could be causing those irritating breakouts that you just can’t seem to shift. Your makeup brushes should be cleaned once a week to remove the build-up of makeup and dirt that has been left to linger. A makeup brush that has been left uncleaned for long enough can become a breeding ground for bacteria such as streptococcus and E Coli. This means that reapplying your foundation with a used and uncleaned brush could not only lead to uneven and streaky makeup application but also blocked pores, breakouts, skin irritation and infections. If your brushes are already coated in makeup from a previous look they aren’t going to help you achieve that fresh and flawless glow you want to achieve this time around. You may as well be attempting the crazy 100 layers challenge as you keep building old, stagnant makeup upon your face. It’s never been so important to wash your brushes, with the StylPro you won’t need to allocate hours of washing and drying time … only a few seconds! 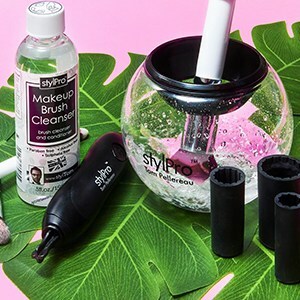 Better still, the StylPro Cleanser will cut through the oil in foundation with ease leaving your brushes as good as new. Created to thoroughly remove even the thickest oil-based makeup on any type of brush , the StylPro Cleanser should be used neat without water. It has a gentle yet highly effective formula that cuts through stubborn cosmetics like a hot knife through butter. Long-stay foundation and lipstick really are no match for the amazing StylPro Cleanser! The deep cleansing and unique formula is registered by the Vegan Society, free from alcohol, parabens and sulphates. It is infused with nourishing Wheatgerm, Grapeseed and Argan oils which will condition your makeup brushes leaving the bristles silky, smooth and protected. A perfect treat for your tools, after all, brushes are expensive. Let’s get those makeup brushes clean, dry and ready for your next look in an instant, with the StylPro and the StylPro makeup brush cleanser.